EDIUS Workgroup 9 for broadcast users provides all the features of EDIUS Pro 9 plus broadcast-specific features with options for GV STRATUS and K2 integration, to streamline your time to air. 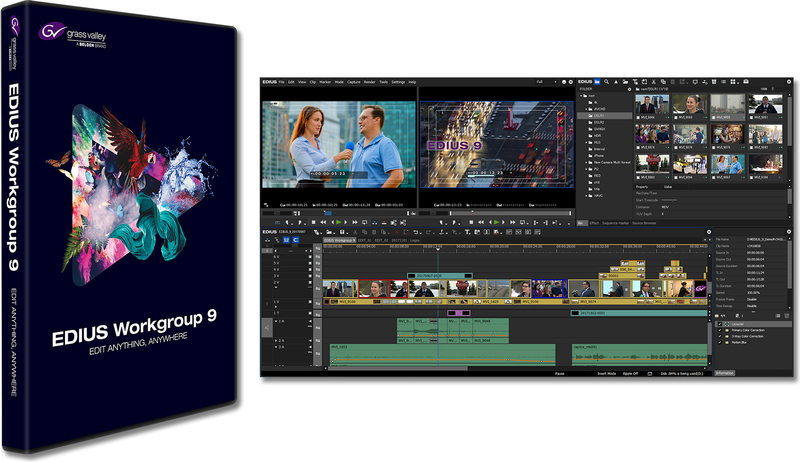 With more creative options and real-time, no-render editing of all popular SD, HD and even 4K and HDR formats, EDIUS Workgroup 9 is THE most versatile and fastest nonlinear editing software available. EDIUS Workgroup 9 gives you real-time editing of multiple formats and frame rates all on the same timeline. That means you can edit faster… and make the time to be more creative. EDIUS Workgroup 9 users are also eligible for a free download of NewBlue’s Titler Pro 5 for EDIUS. EDIUS Workgroup 9 has optional modules to connect to the GV STRATUS video production & content management system and edit-in-place on a Grass Valley K2 SAN.Together with GV STRATUS, EDIUS Workgroup 9 introduces powerful speed and flexibility for broadcast, post-production and multiplatfom environments.